One of the reasons that distinguish Indian cuisine from others is its characteristic yellow colour. It is this quintessential Indian spice which is an absolute must-have in any Indian kitchen. Turmeric comes from the root family of vegetables and resembles ginger root. It has a deep, golden-orange colour when raw. The most popular way of cooking with turmeric is in powder form. When raw turmeric is sun-dried and then ground into powder. Turmeric grows in tropical countries such as India, Srilanka, China, Bangladesh to name a few. Although now popularly used in many worldwide cuisines, it is extensively used in South Asian and Middle Eastern cuisine. Turmeric has a very mild flavour and does little to lift the taste of the dish. It is often added to most Indian spice blends and is primarily used as a colouring agent and for additional health benefits. Turmeric has a unique flavour and therefore is unlike any other spices. Cooking with turmeric does little to lift the flavours of the dish other than adding colour . The taste falls somewhere between bitter to astringent. Turmeric comes in various forms. You can use it raw, buy the dried whole turmeric root or the most popular form which is the powder or ground turmeric. Raw Turmeric can be peeled and chopped, grated or made into a paste and added to dishes such as curries, soups, stir-fries, teas and even smoothies. Fresh turmeric is recommended to make face packs and for other medicinal purposes. They have a much stronger smell and colour and may stain your fingers and other kitchen gadgets. So you do need to be careful unless you are a fan of everything yellow !! 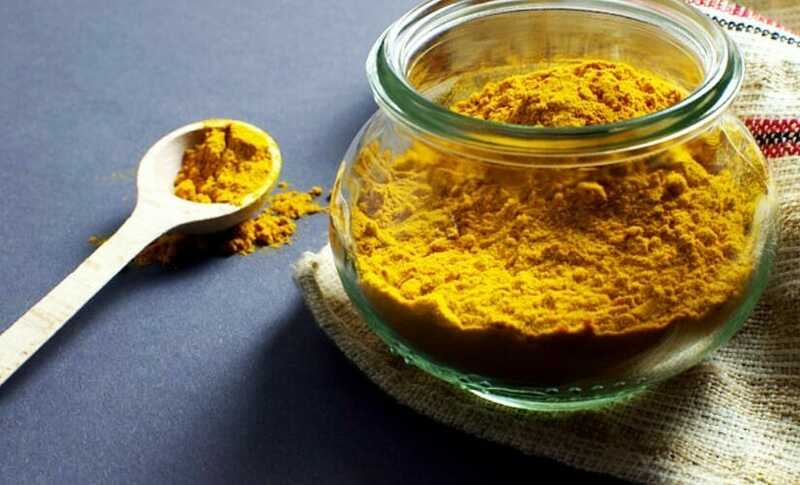 The dry whole version is not all that popular, however, few people do like to make their own turmeric powder at home or add whole turmeric pieces to make other spice blends. You can also drop a chunk of the root into broths and soups and remove it before serving. Powder turmeric is most popularly used for cooking and other purposes due to the convenience. You can add powdered turmeric straight into the dish or marinates during the cooking process or before cooking. This article on Wellness Mama gives 12 different ideas of using turmeric in your daily lives. Read about 28 Essential Indian Spices and How to Use Them for Cooking. Turmeric is considered one of this century’s super food. There are numerous websites listing benefits in details. Here is an evidence-based study highlighting few of the benefits of Turmeric. Turmeric is considered a natural detoxifier. Consuming turmeric stimulates the production of enzymes which helps in eliminating toxic substances from the body. Its intake repairs damaged cells of the liver and fight several liver problems like cirrhosis, hepatitis and jaundice. Turmeric has anti-inflammatory property can help in reducing joint inflammation and pain. The ancient Indian grandma recipe which still holds true even today is drinking a cup of warm turmeric milk after a fall or any muscle related injury to help ease the pain. Turmeric can be helpful for overweight people struggling to lose weight. Consuming a tsp or two of turmeric with water or milk helps burn excess fat by increasing your metabolism rate. As mentioned earlier, Turmeric detoxifies liver naturally, which is responsible for fat metabolism. As metabolism speeds up, calories burn faster. Just like a pain killer, Turmeric is also used as an age-old remedy in India for healing wounds. Application of turmeric normally raw turmeric paste on open wounds, reduces pain and bacterial build up. Its anti-inflammatory property also helps in reducing inflammation. Being an anti-biotic, turmeric kills the infectious bacteria in the wound. Turmeric is considered a natural skin brightening and lightening agent. Its application on the skin with milk and gram flour helps to improve skin texture and get an even bright tone. The anti-inflammatory property of turmeric removes excess oil and opens clogged pores which cause acne and pimples, while its anti-bacterial property kills acne causing bacteria. Turmeric has antibacterial, anti-fungal and antiviral properties which help in killing various bacteria and fungus which are responsible for causing illnesses like cold, flu etc. Drinking a glass of turmeric milk is a natural way to improve your immunity. It also helps in reducing sore throat when you are down with a cold. Buying powder turmeric is the easiest and convenient way to buy this golden spice! You can now buy powdered turmeric from most local supermarkets. If you wish to use it for application on face or skin then raw turmeric is a better option. It may be difficult to buy raw turmeric from a regular store but specialist health or whole food store may stock them. Fresh turmeric should be wiped dry and wrapped in a paper towel and stored in an airtight container in the fridge. Dry whole turmeric or ground turmeric should always be kept in a tightly sealed glass container in a dark, dry place away from direct sunlight. Well stored Turmeric powder keeps its colour and properties for almost a year. Since turmeric is a very mild spice with hardly any strong flavour compound, it goes with almost any spice. Turmeric is more of a colouring agent as opposed to a flavouring agent and therefore there is not any suitable alternative to it. In case of taste substitute; curry powder can be used for both taste and colour. To add colour Saffron is the most suitable alternative, But care should be taken on the amount used as pure saffron has a very different and strong flavour profile compared to turmeric. Do you have something to add to the post? Maybe a benefit or a recipe? Please do share your thoughts. I love to hear from you. And as always if you think this article deserves more eyes then please do share by clicking the share and/or save buttons. Download my unfailing formula and a 7 day meal plan for free! Hi! I am Sunrita, welcome to my tiny world of spice. Here you will find pots of sizzling recipes, spoonful of tangy tips with a pinch of spicy humour. Cooking for me is something that should be simple, smart and stress-free. I share with you my experience of rustling up easy yet exotic family-friendly meals in minutes simply by adding a touch of spice. So embark on the journey of Spicing It Upp!! @2019 - Spice it Upp. All Right Reserved.